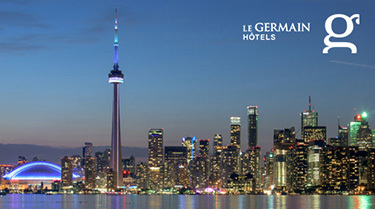 This ultimate Toronto experience provides the opportunity to stay the night at the luxurious Le Germain Hotel Maple Leaf Square, dine at The Bottom Line – Toronto's Classiest Sports Bar, and visit the one and only Hockey Hall of Fame! Packages for Two & Family Packages available. Book now . Anniversary Street Banners – Bring a Piece of The Hall Home! 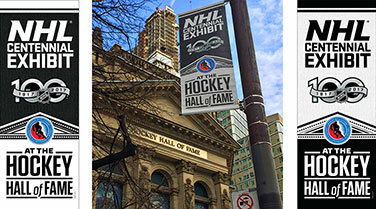 The Hockey Hall of Fame is providing you the opportunity to purchase their street banners commemorating two recent anniversary exhibits – the NHL Centennial Exhibit (2017) and the Stanley Cup 125th Anniversary Tribute (2018). 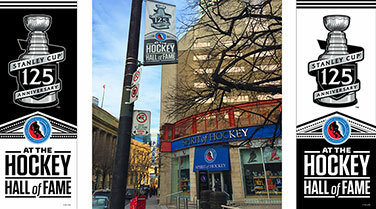 Each banner was displayed within downtown Toronto during their respective exhibitions. A unique collectible, each banner measures 2.3 ft. W x 5.9 ft. H.
A limited number of street banners are available. A maximum of 8 banners per person. Shipping fees are $25 for Ontario addresses, $30 for Canadian residence outside of Ontario, and $35 for United States orders. Option to pick up the order at the Hockey Hall of Fame is available. Banner colour subject to availability. Purchases are non-refundable. All banners were pre-used during an outdoor street banner campaign. Although banners have been cleaned, slight residue and wear may appear – much like game-used jerseys! BUY YOUR FREE PREMIUM-CARDBOARD GOGGLES TODAY! 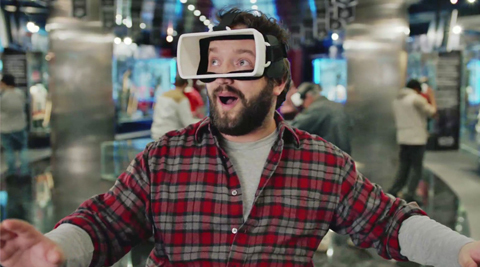 To obtain your free pair of Real RealityTM cardboard goggles, ask for them at the Hockey Hall of Fame Admission Desk. While quantities last. Have your next birthday party or team function amongst 65,000 square feet of interactive fun and the finest collection of hockey artifacts from around the world! Party packages are available in two types of experiences and are designed to treat your guest like VIPs! 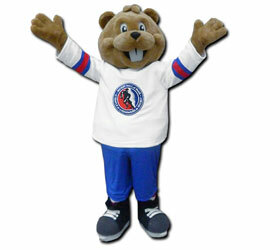 Esso, Fueling Canada's love of Hockey for over 30 years. 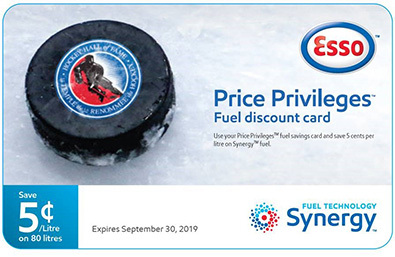 Hockey Hall of Fame guests visiting from October through June will receive an Esso Price Privileges Fuels Savings Card. This Price Privileges card is a fuel savings card that instantly saves you 5¢/L upon use at Esso stations across Canada. One card per Hockey Hall of Fame admission transaction, while quantities last. Fuel savings on a maximum of 80 litres. Esso, Esso Extra and PRICE PRIVILEGES are trademarks of Imperial Oil Limited. Cards expire September 30, 2019. Breakaway to the Hockey Hall of Fame with PRESTO PERKS and score 20% off general admission when you flash your PRESTO Card. Leave the car at home and create your own "Hockey Day" with family and friends on the GO. It’s even more affordable now that kids 12 and under always ride for FREE on all GO trains and buses. PRESTO PERKS is just one way PRESTO unlocks discounts to top attractions and experiences across the region. Keep your PRESTO card handy and stay tuned for even more PERKS and savings. 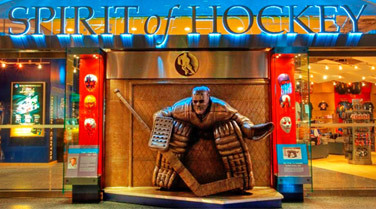 Show your UP Express Long Layover ticket at the Hockey Hall of Fame and SAVE 20% off general admission.Offer until September 2, 2019 and cannot be combined with any other offer. Must present same day UP Express Long Layover ticket at time of purchase. The UP Express Long Layover ticket lets you spend up to seven hours in the heart of Toronto for the price of a one-way ticket, and then return in time to catch your flight. Long Layover Fares: Individual $12.35; Family $25.70 (up to 2 adults and 3 children under 19). Save 20% with your UP Express Long Layover Ticket. Please note that there are no storage locker facilities at the Hockey Hall of Fame. Click here for luggage storage options at Pearson International Airport. The Hockey Hall of Fame called upon fans to help come up with a name for the newest addition to the HHOF family and the response was overwhelming! Over 2,300 creative submissions were received from throughout North America. Click here to see the winning submission and who was selected as the lucky Grand Prize winner.